Not only do we sell these high-quality stainless automotive restoration bolt kits, but we also use them in our restoration projects. 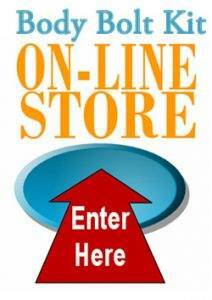 These kits include body bolt kits, chassis, suspension bolt kits and engine bolt kits. 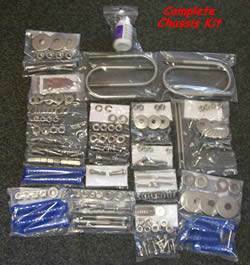 We offer automotive bolts kits that fit a broad range of makes and models. These totally stainless bolt kits are available for classic cars, vintage trucks, muscle cars, late model trucks, Jeeps, Corvettes, and Volkswagen. 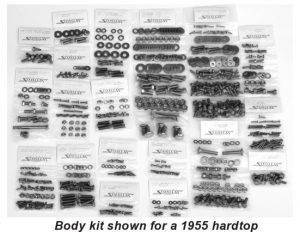 Each kit includes virtually every nut, bolt, screw and washer needed to assemble your classic car correctly, truck or hot rod. Each bolt kit contains individually labeled component fastener kits, taking the guess work out of the assembly process. These kits are available for most U.S. V-8 and many 6-cylinder engines. Our engine bolt kits include all the correct bolts and washers for the distributor, fuel pump, intake, oil pan, thermostat, timing cover, water pump and valve covers.